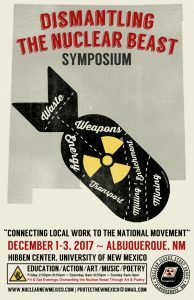 The Albuquerque-based Nuclear Issues Study Group (NISG), formed in June 2016 “To Protect New Mexico from All Things Nuclear.” NISG came together in response to the lack of young organizers, young activists, and people of color at the forefront of nuclear issues affecting New Mexico. We live in a state that is targeted by the nuclear/industrial complex and we see this as environmental racism. We are primarily concerned about new threats of uranium mining, weapons modernization, and nuclear waste dumping, while many long-standing issues remain unaddressed. We emphasize the need for a new way to reach out to young people, with a focus on recruiting a new generation of New Mexicans to get involved in resisting every level of the deadly nuclear fuel chain. The co-founders, Eileen Shaughnessy and I, wanted to bring the perspectives of a more diverse and younger population to the decision-making table of national organizing against nuclear proliferation. Eileen started a class within the Sustainability Studies Program at the University of New Mexico (UNM) called “Nuclear New Mexico”—now in its 7th semester. The class gives students an honest history of nuclear colonialism in our state, as well as a pathway into activism. I have more than a decade of experience organizing against uranium mining on indigenous lands. Between the two of us, we’ve been able to tap into a wide network of resources and support to start NISG. The symposium explored every aspect of the nuclear fuel chain—past, current, and future—as well as highlight some key threats to New Mexico that Nuclear Issues Study Group is focusing on including: Sandia National Laboratories’ Mixed Waste Landfill and the proposed Centralized “Interim” Storage of high-level radioactive waste. Since then, we have been steadily focused on resisting the proposed Centralized “Interim” Storage, aka “CIS” of high-level radioactive waste in the area. NISG proudly participated in the 2018 New Mexico Legislative Session, helping to educate legislators about the threat of CIS and asking them to intervene on the issue. Currently, the US Nuclear Regulatory Commission (NRC) is processing an application from Holtec International to build a CIS facility between Carlsbad and Hobbs, a “temporary” dump that would hold all of the nation’s waste uranium fuel from commercial nuclear reactors for up to 120 years. In a collaborative effort, NISG worked with UNM students, New Mexico activists and organizers, the SEED Coalition from Texas, and legislators on a letter urging the NRC to slow down the licensing process and allow more time to thoroughly study how this facility and waste transport could impact New Mexico. In total, 21 representatives and nine senators signed on to this letter! Along with local community members, we will present the letter and our concerns at this spring’s public hearings to show how, collectively, we believe that nationwide waste transports and dumping on New Mexico are injustices that must be addressed on local, state, and national levels. We will continue to work toward stopping additional radioactive waste from being created in our state, as well as keeping it from being transported and dumped here. —Leona Morgan works with the Nuclear Issues Study Group in New Mexico.